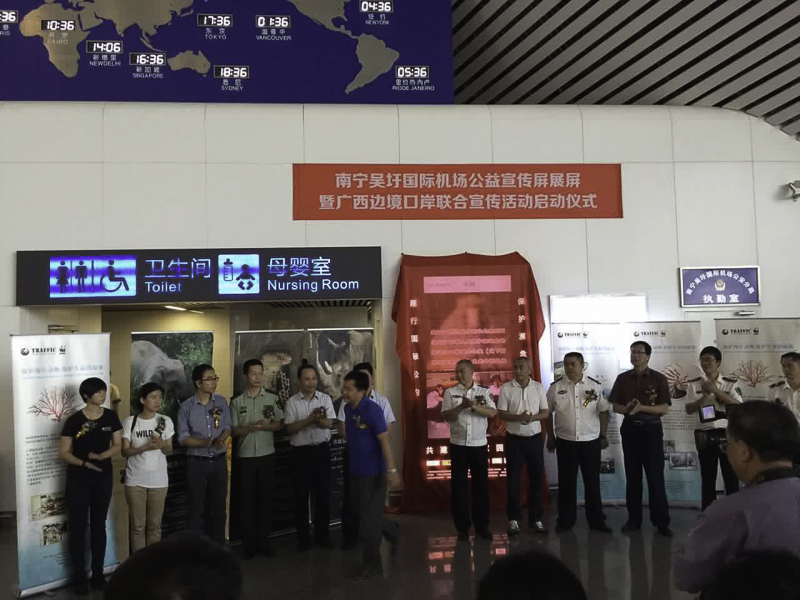 Recently, the Guangxi Provincial Office for Combating Smuggling, Guangzhou Branch of the Endangered Species Import and Export Management Office, Nanning Wuxu International Airport, Nanning Customs, Forestry Department of Guangxi Province, WCS, IFAW, WildAid, together launch the ceremony of unveiling an advertisement screen in the border port of Guangxi. The screen will be displayed in the airport permanently as to broadcast rolling photos and videos in advocating protection of endangered species. In order to coordinate with this this ceremony, WCS, IFAW, WildAid and other organizations held a ‘sign and promise’ activity to fight against ivory trafficking and its illegal outbound and inbound carrying as well as all the negative effects coming from illegal ivory trade. The staff from different organizations and volunteers from the Green Environmental Protection Association of Guangxi University explained the sad story behind ivory trade to travelers and encouraged them to make a promise of ‘don’t bring the ivory home’. China plays an important role in protecting and saving endangered wildlife under CITES and also has commitment to build up an ecological civilization. As the general public, what every citizen can simply do is not buying or carrying any ivory and its product when we travel or work overseas.